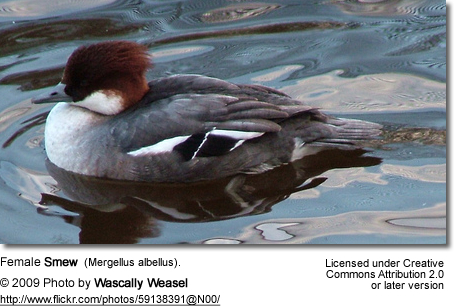 The Smew (Mergellus albellus) is a small duck which is intermediate between the mergansers and the goldeneyes, and has interbred with the Common Goldeneye. It is the only member of the genus Mergellus (Selby, 1840). The drake Smew, with its 'cracked ice' appearance, is unmistakable, and looks very black-and-white in flight. The females and immature males are grey birds with chestnut foreheads and crowns, and can be confused at a distance with the Ruddy Duck; they are often known as "redhead" Smew. It has oval white wing-patches in flight. 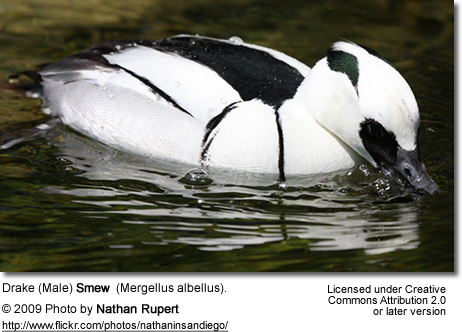 The Smew's bill has a hooked tip and serrated edges, which help it catch fish when it dives for them. This species breeds in the northern taiga of Europe and Asia. It needs trees for breeding. The Smew lives on fish-rich lakes and slow rivers. As a migrant it leaves its breeding areas and winters on sheltered coasts or inland lakes of the Baltic Sea, the Black Sea and northern Germany. 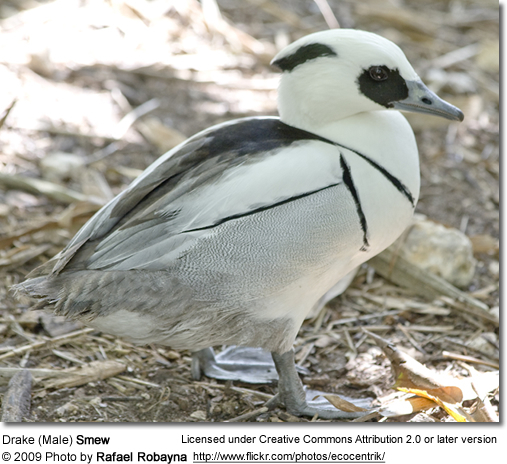 The Smew breeds in May and lays 6-9 creme-colored eggs. It nests in tree holes, such as old woodpecker nests. It is a shy bird and flushes easily when disturbed. 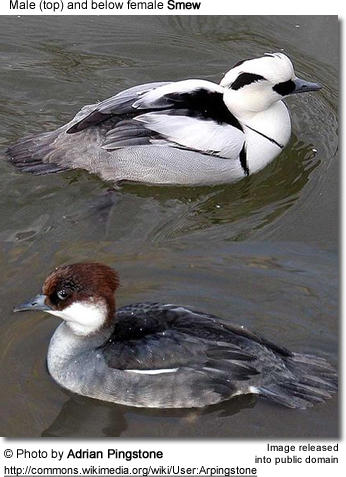 The Smew uses itsbill with a hooked tip and serrated edges to catch fish when it dives for them.